Over the years I have seen pictures of Iris Apfel in various magazines. How could you not notice her? She jumps out of the page with her eclectic, colorful, stylish and layered ensemble paired with those over- sized jewelry and glasses? And then there that energetic aura about her. Most often, you will find her smiling happily. Apfel is a well-known decorator, stylist and a model. Along with her husband Carl Apfel they founded a custom fabric manufacturing company that recreated old, historic decorating fabrics. The couple worked on many decorating projects, including The White House. 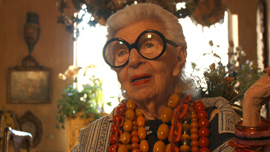 So, naturally when I discovered that Albert Maysles had made a film simply titled “Iris” about 93-old Apfel I wanted to see it. I wanted to find out more about this stylish icon who does not seem to slow down at all. The film was part of this year’s programming at the San Francisco International Film Festival. This 80 minutes long film is an eye-opner and captures the essence of Apfel’s life and fashion philosophy. Born and brought up in New York, Apfel displayed a flair for putting things together in an interesting way, which she developed into her signature style. There is a point in the film where Apfel shares a story about Mrs. Loehmann of the famous Lohemann’s chain of stores. Apparently Mrs. Loehmann once told a young Apfel that she may not be pretty but she had style. With her eclectic style and signature over-sized jewelry and glasses, Apfel has been a fixture of the New York fashion scene for decades, and continues to participate and inspire younger people on how to embrace their inner creativity and style. “I feel lucky to be working. If you’re lucky enough to do something you love, everything else follows.” Age has not stopped her from working and enjoying life Maysles captures the essence of Apfel’s life and her love and joy for creativity and fashion. Maysles passed away in March 2015 and this was one of his last films.